Idle Pinterest scrolling led me down a rabbit warren of ponte roma dresses to keep me warm but well dressed this winter. I explored different shapes, lengths, colours and styling. Finally settling on rusty reds and berry purples with a trapeze silhouette, plain but absolutely primed to pair with a hand-knitted shawl/cowl or a statement necklace. 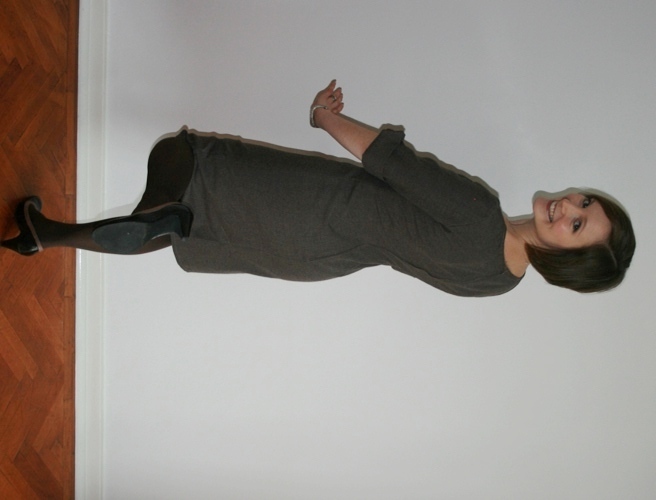 I took my previous hacked dress pattern (it’s based on the best bits of Renfrew, Audrey, Staple and Briar) and used this tutorial to trapeze it. 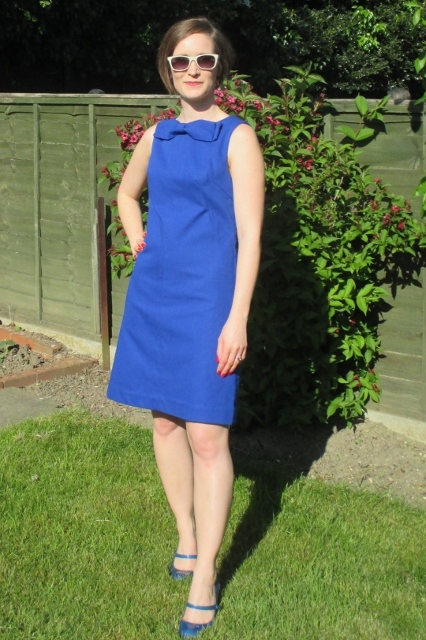 It was a speedy hack, used just 2m of fabric and was a quick sew too. The end effect is completely shapeless from the bust down but I love the abundance of fabric. As I wasn’t sure how my hack of a hack of a hack pattern would work out… or even if I’d like or suit the new-to-me silhouette, I didn’t worry too much about the fabric. In fact I used it as an opportunity to try a colour outside of my usual palette. If you’re reading this thinking new silhouette, new colour, new year, new you… you’re wrong. I actually dreamt and sewed this up in December! 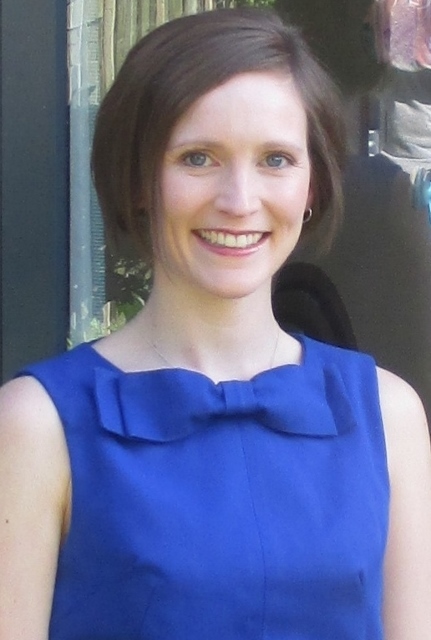 So I’m interested to hear… what do you think of the shape and colour? What new things are you trying? It was summer 2015 in Walthamstow market when I felt that the roll end of this misty trees printed scuba needed to come home with me. I’ve been pondering a suitable pattern ever since. The longer I pondered, the more I failed to see why I’d been attracted to the fabric in the first place. Scuba… so not me. 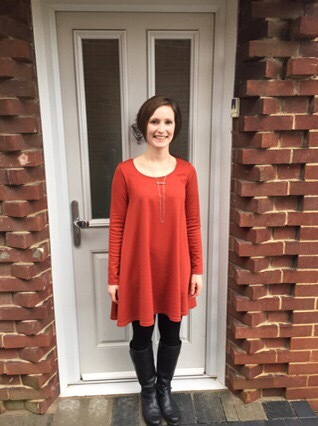 I was happy to sacrifice it to test out GBSB The Drapey Knit dress that I’d pinned to my ‘See it Sew It‘ Pinterest board. It’s a free pattern download with some quirky details. The pattern has front pockets created by the side front pattern pieces, these also overlap at the neckline to create a simple origami effect. Sew Different has some construction instructions that really helped me, particularly in ensuring the the trees were growing in the right direction. 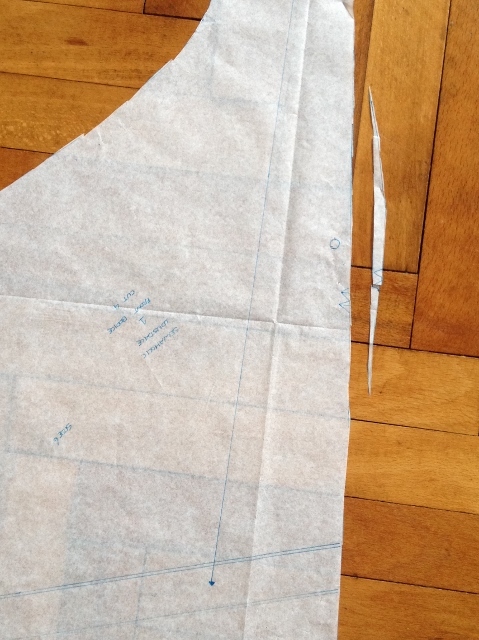 I cut the smallest size but took in the side seams from bust to hip a lot… I just kept narrowing until I was happier that the volume worked for my proportions. 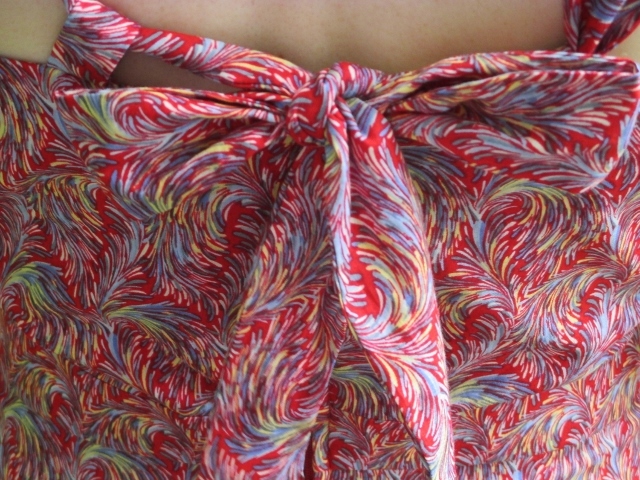 The hem and sleeves were finished with a twin needle stitch and I hand tacked the neckline facing at the internal seams to prevent it from flipping out. 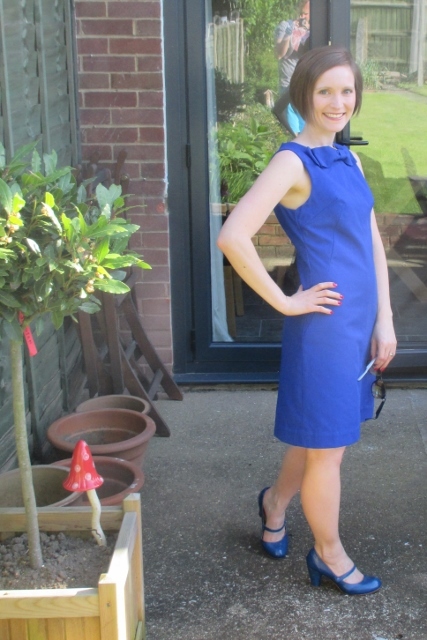 I used the blog photos to test out the possibility of wearing it to a wedding and decided it was worth a try. Guess who got the first dance? This royal blue gaberdine and matching lining were the founding members of my ‘stash’ and were purchased because royal blue is my favourite colour ever in the world. I think the fabric survived my year long stash diet because I couldn’t decide what to use it for. The gabardine is quite heavy and stiff. At one point I did consider sailor trousers but decided that the only bright colour you can/should make wide legged trousers in is red. 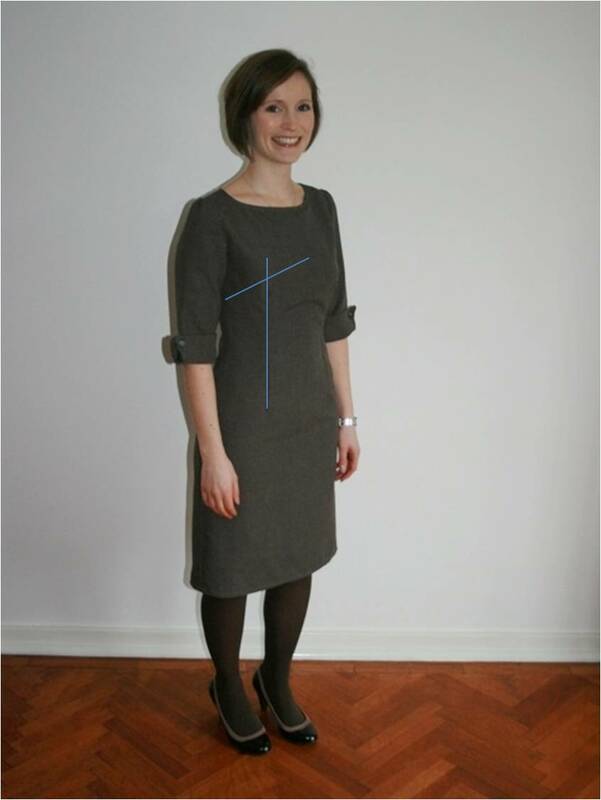 For a long time I’ve admired Marrie’s beautifully finished dresss. 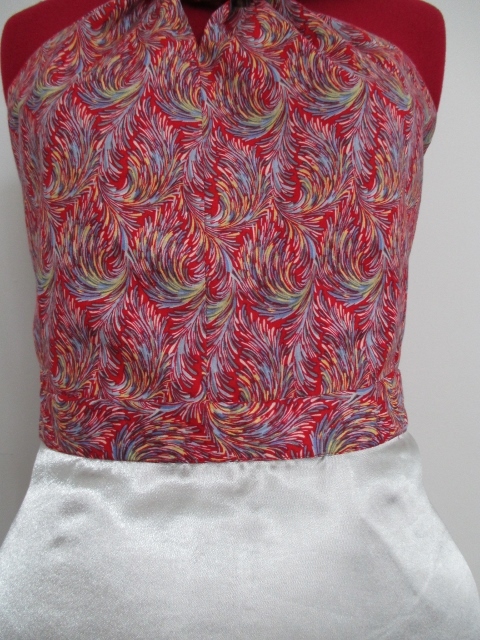 I particularly like how she has fashion fabric facings and lining at the same time – here’s a fine example. I think, but I don’t know for sure (because I was too miserly to pay to download the ebook that Marrie kindly linked me to when I asked how to do such a neat finish) that I have figured out how to do it. But I didn’t stop there… no, I wanted it all! 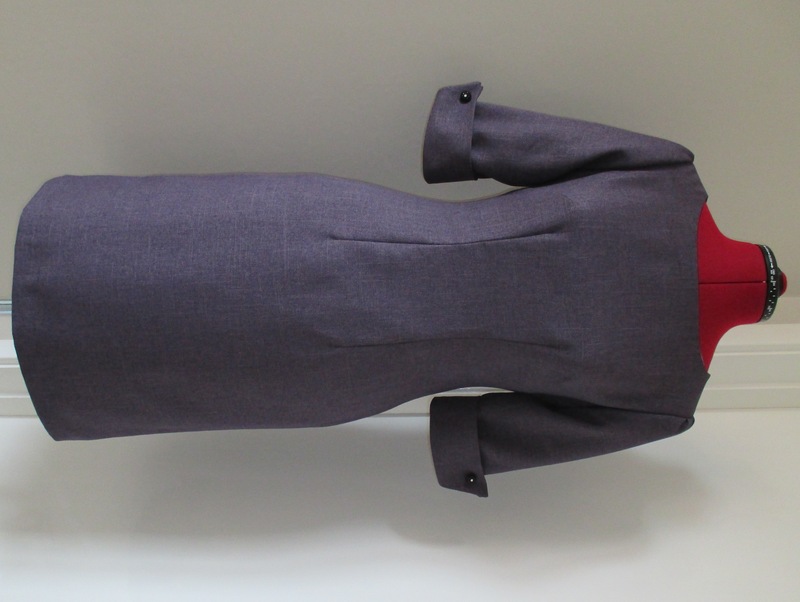 A fully machined, lined dress with the lining attached to the zip and arms holes without any hand sewing until I got to the hem. At which point I used a neat trick to get evenly spaced stitches and had that as my first instagram (gotta try to catch up with the times!). 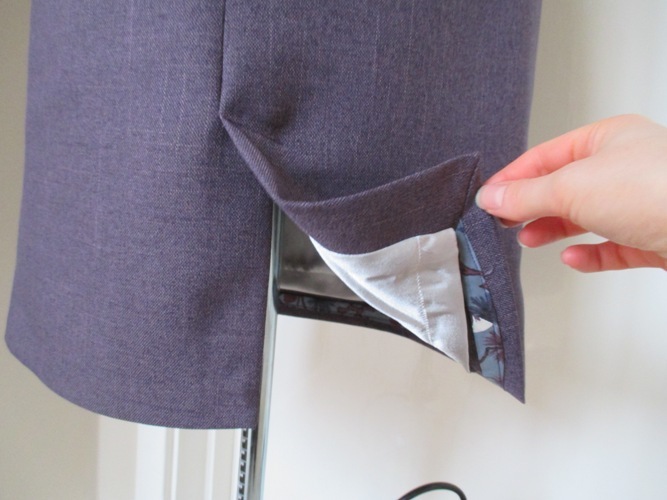 Wanting it all turned a seemingly easy pattern into somewhat of a logistical sewing challenge. Sewing a few seams here and there then pausing to consider my next move broke a complex puzzle down into easier to solve pieces. Slowly I built an order of construction that didn’t at any stage end up in an unsolvable pickle that can only be undone with an unpicker! So this dress has been a couple of months in the making while I ruminated over what part to attach to where and in what order. Cut facings out of fashion fabric turn raw edge under and top stitch to right side of lining (I also basted to the other parts of the facings to the lining inside the seam allowances for good measure). 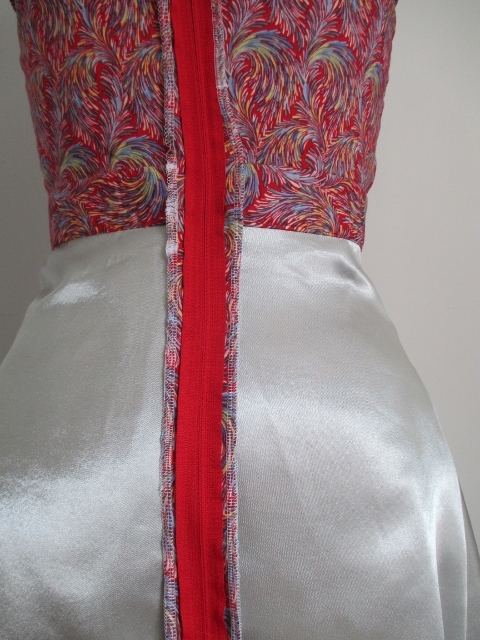 Sew all darts and shoulder seams on the dress fabric and lining. 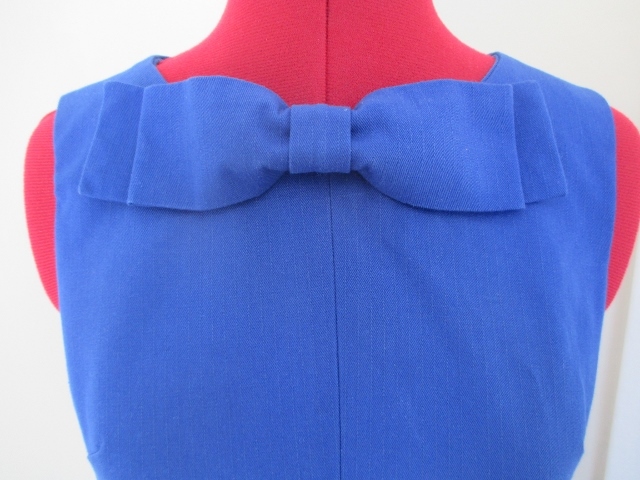 Attach lining to zip and to dress at the neckline. Burrito roll and pull through to sew lining to dress at arm holes. 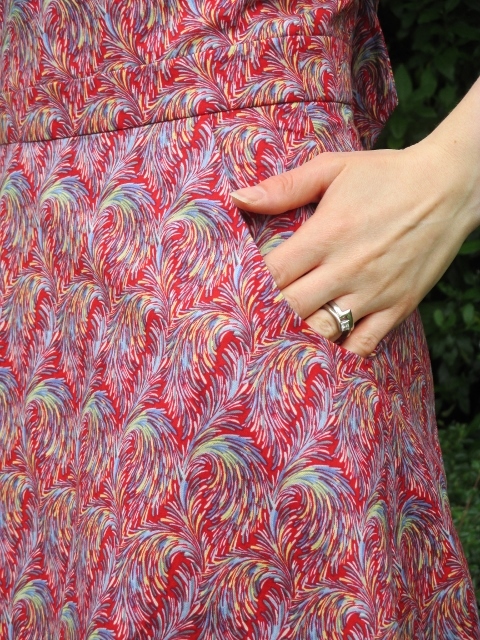 Sew the side seams of the dress and lining as two very long seams (Sixth and seventh steps only from this tutorial). Critically, I worked out early on that I shouldn’t get sucked into the method of pulling the dress through the shoulder seams. 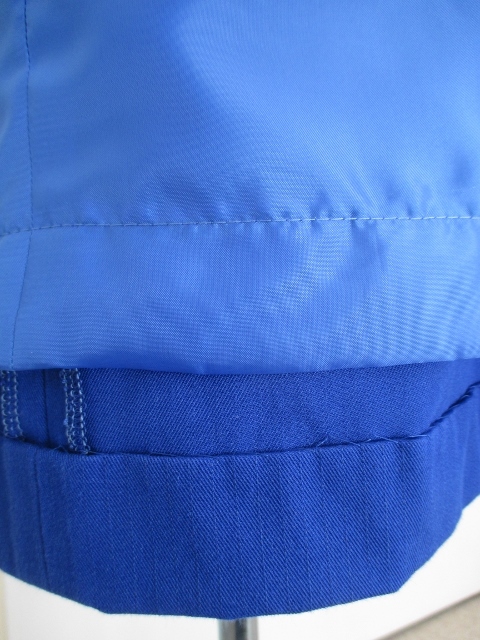 While it’s a nice enough technique, the zip would have to be inserted last which as far as I can fathom means hand sewing the lining to the zip. My final flourish was to go off piste for the bow too. I just didn’t like the dangilies and since I’d rejected all the other pattern instructions I was confident in this rebellion too. Typically my bust is a size larger than my waist and my hips two sizes larger than my waist. With the French darts and looser fit at the hips I figured a size 12 all over would be a good enough starting point from the finished garment measurements. As soon as I could try it on, I did. I could see that the darts weren’t pointing towards the apex of my bust. I marked the place the darts should be pointing towards with chalk to help me make the necessary alteration (explaining where and why darts should point there made for an interesting talking point at a dinner party with non-sewers on the dress’ first outing!). Understandably I had a lot of excess fabric below my bust because of the errant darts. First I unpicked the side seams a little, then unpicked the bust darts completely. I kept the dart leg position at the side seam the same but angled them towards my bust point ending about 2 cm from the chalk dot. I like to try on garments between each fit tweak so that I can see what’s going on. Sometimes one change influences subsequent fitting steps more than you imagine it would. 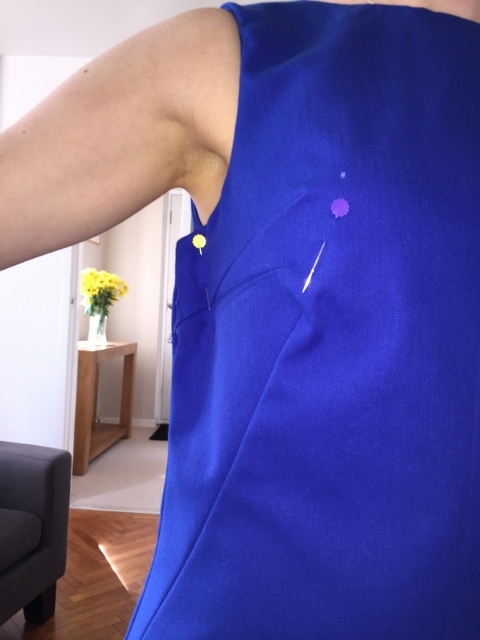 When I tried the dress on again, the excess fabric was still a problem but the next course of action was obvious; extending the French darts upwards to end somewhere on the magic circle of 2-3cm radius of the bust point. For a final fit I took in the side seam about 1.5cm from the under arm, down past the bust line then started to blend back to the original seam allowance finishing about 5 cm above the waistline. Then pressed as best I could to remove the former dart creases. Another change was to chop a mighty 3 inches from the bottom and then turn up a whopping 1 3/4 inch hem. I felt safe to just chop off 3 1/2 inches from the pattern pieces in readiness for my next make – that’s a lot of fabric to be saved. In addition to transferring the new bust dart, French dart and grading the side seams at bust level to what equates to a size 8, I also got rid of the centre front seam. 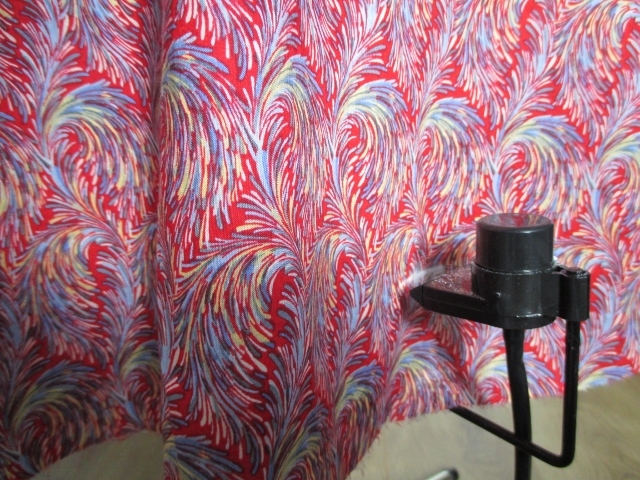 Sure the original pattern piece has some really subtle shaping (plus 1/8 inch at the bust, minus 1/8 inch at the waist – I can afford to ditch both from a fit point of view) but the lure of fabric with fancy prints is so strong, I don’t want to be pattern matching a centre front seam. Adding an extra neck/shoulder dart (the original has one and I quite like this detail). 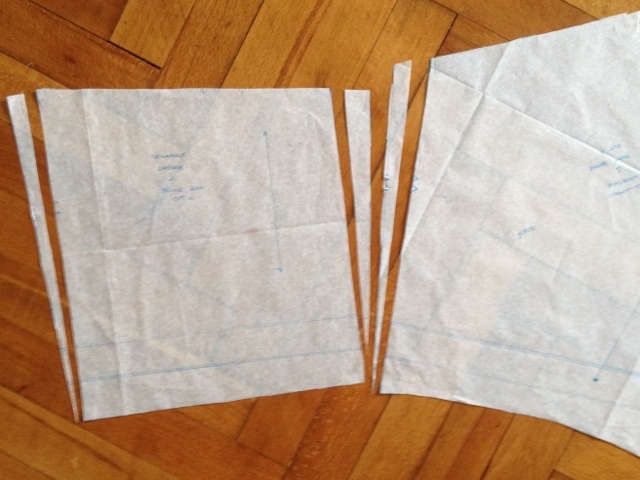 The ‘fold and smoosh’ method on the paper pattern piece – fold a dart shape the same as the pinched gape then hand flatten the tissue paper to return it’s 2D qualities. Try to absorb the gape at the centre back by trimming off some excess where the zip is inserted. 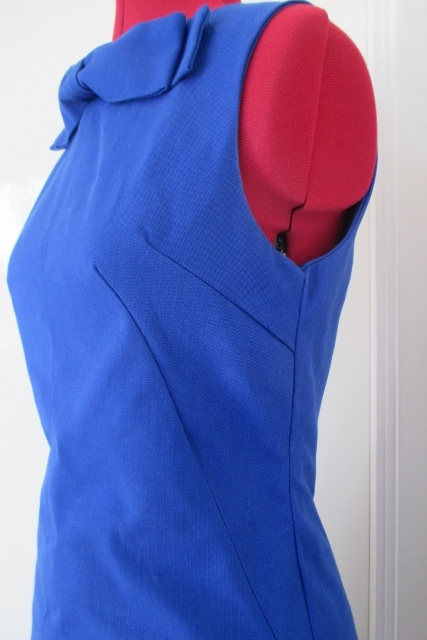 Try to absorb some gape into the shoulder seam by angling the back pattern piece shoulder. Or perhaps there’s another option I haven’t thought of yet – leave me a comment if you have an idea or can recommend/discourage me from one of the options listed above. 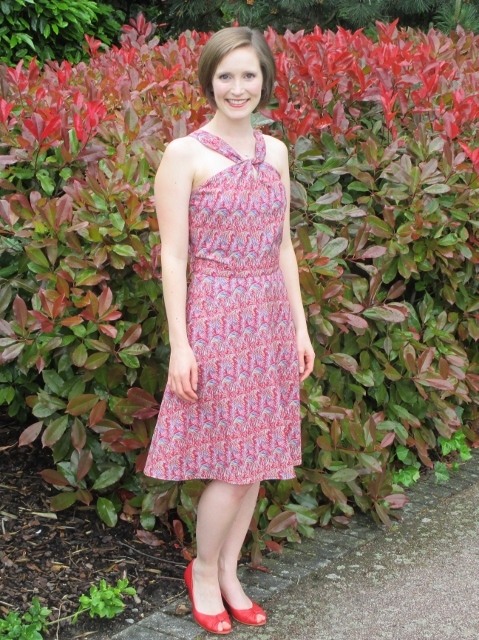 I think this dress fills gaps in both my wardrobe and sewing pattern stash. 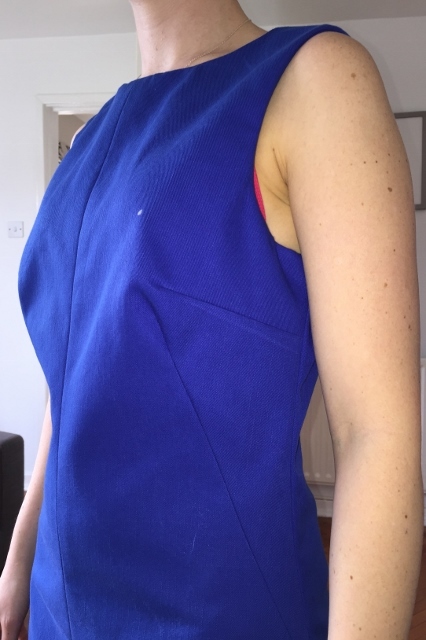 I really like the shape on me and can see plenty of scope in the neckline options and using different fabrics. Plus, after so much work on the fit and on working out a fully lined construction process, this pattern is well on the way to becoming a TnT. Occasionally everything aligns to fulfill all sewing and blogging commitments in one fell swoop. 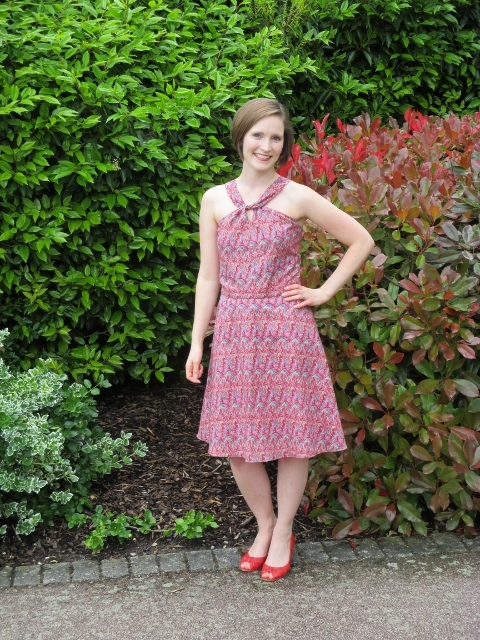 Ticking boxes for The Monthly Stitch’s Indie Pattern Month ‘New-to-me’ competition, my findings for Me Made May and Stash Diet… not to mention a winning fabric and pattern match, I present to you my Sewaholic Lonsdale Dress. 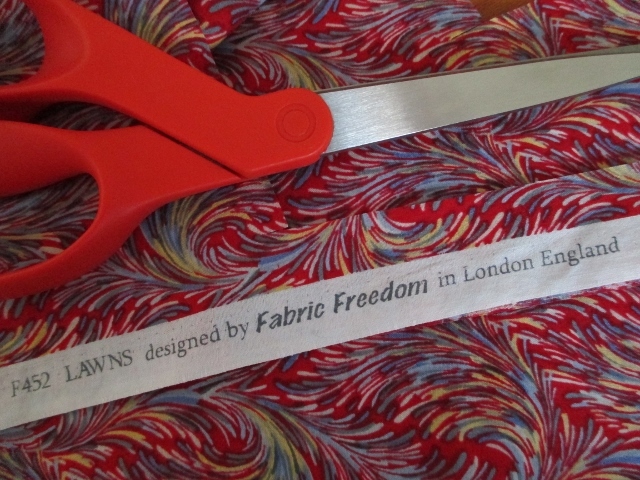 I used stashed Fabric Freedom lawn which I purchased from Dalston Mill last summer. I have to give a special thank you to the lady who, when asked “Red or purple?” Very decisively answered “Red”. Better to ask a stranger their opinion than blow my cash on both or walk away with neither, right? I want mention to Purple Stitches too. I purchased the pattern from this store (it is available as a PDF but I don’t have a working printer at the moment). I was impressed with Purple Stitches’ good value delivery price and excellent customer service. I’m not being compensated for this comment, I just like to give praise where it’s due! The fit of the toile wasn’t too bad but I wanted to absolutely nail the fit of the bodice so I made a number of tweaks. 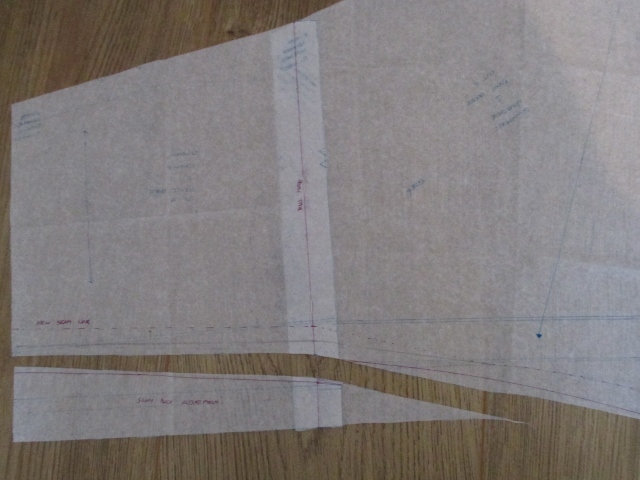 Taking wedges from the side seams and the centre back (zip) seam, I tapered from the bust to the original size 6 waist. 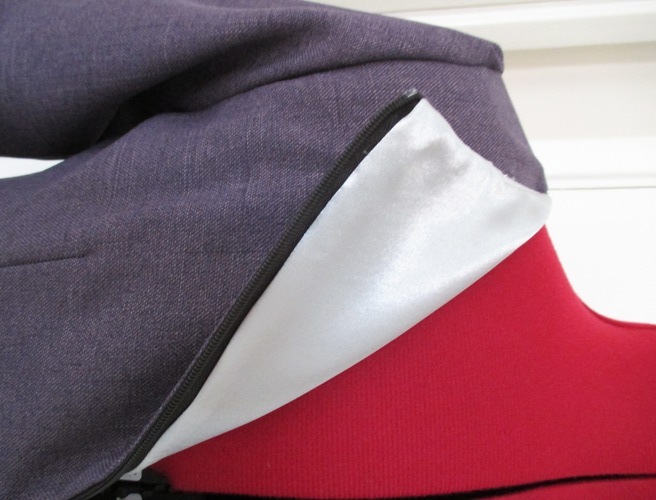 I shaved off some of the curve of the centre front seam too – a cheat small bust adjustment I think but it worked for me. Wedges to fit bust with very little ease. 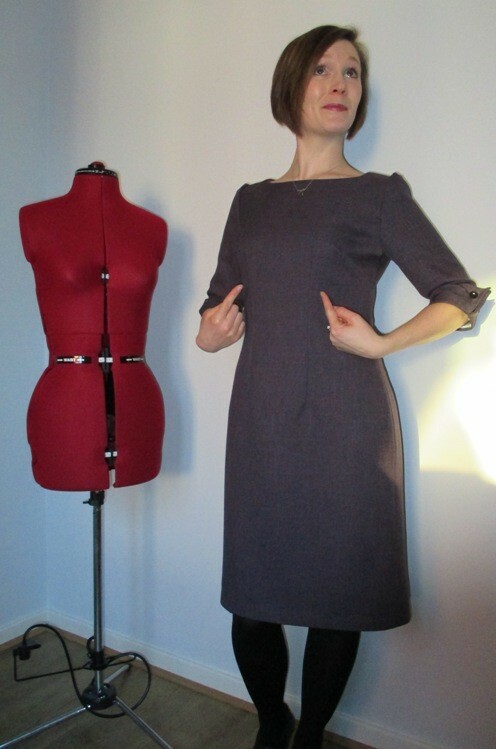 The largest alteration I made was a sway back adjustment which for my shape landed right on the waist seam. 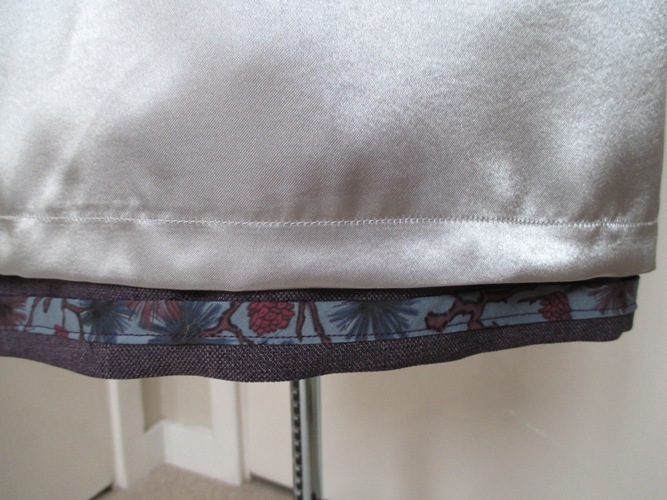 As for the skirt length, I removed 3 inches from View A (shorter) skirt so that, once hemmed, it just touched my knee. Although after a sway back adjustment to the bodice, I was forced to load up my hemline marker with chalk to make sure it was level. On the inside I lined the skirt, pinked seams that were enclosed in the self-lined bodice and overlocked all other seams. 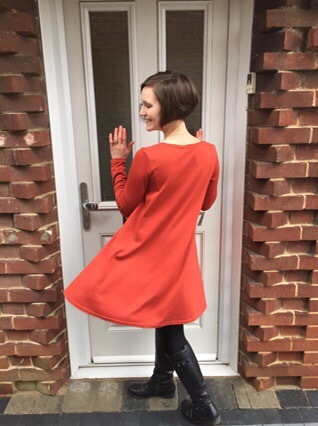 The pattern is beautifully drafted (I swooned over how easily the pockets came together with a professional finish) and deceptively easy to sew. I followed both the online sewalong and the printed pattern instructions which made for a really easy construction process with lots of extra guidance, tips, photographs and options. 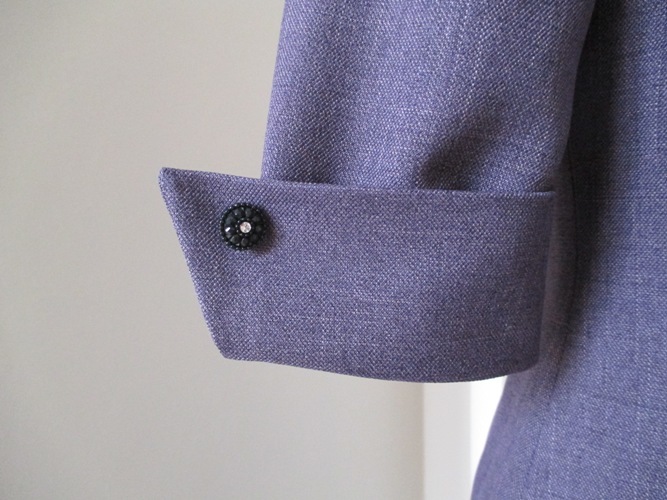 I like that the sewalong comes in bite-size posts… just perfect for evening sewing. 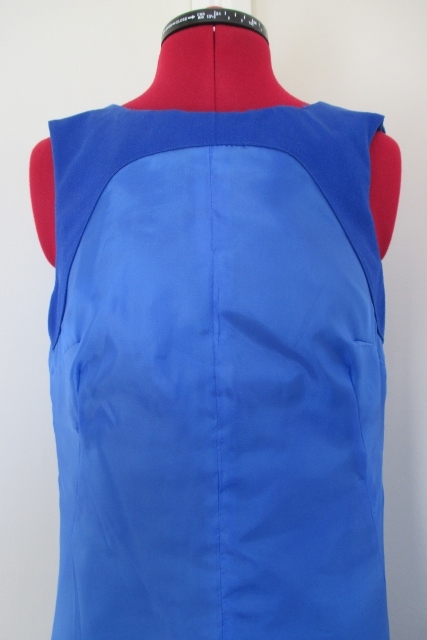 In fact I was inserting the zip with a fantastic hail, rain, thunder and lightening display going on outside… also questioning why I was sewing a summer dress at all! 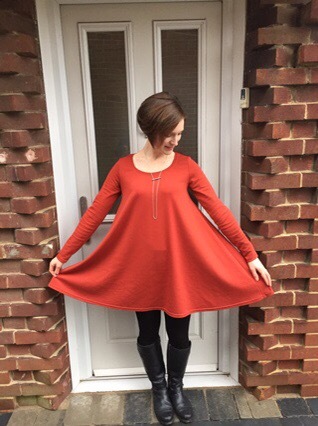 As I mentioned, I’ve entered this dress into The Monthly Stitch ‘New-to-Me’ competition for Indie Pattern Month… so of course once the voting opens on Sunday I’d be grateful for your support! 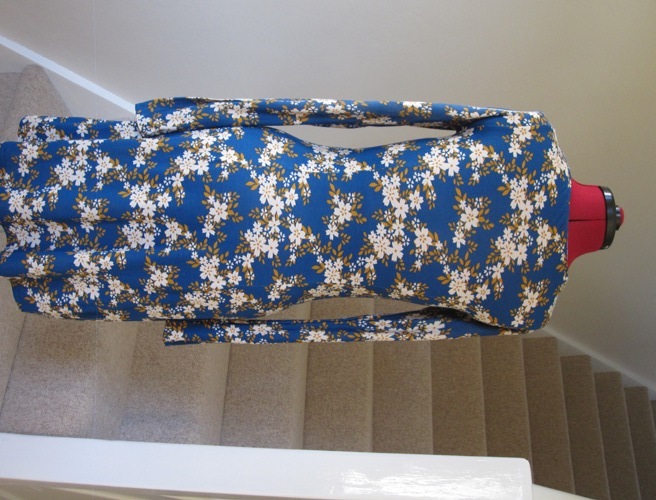 When I posted my brown NL6000 dress I asked for help with an ‘n’ shaped ripple of fabric under my bust. If I imagined the lines of the bust darts and the waist darts extended… *gasp* they didn’t cross at the apex of my bust! The waist darts needed to be moved towards the centre by 1 inch. With no fabric purchases allowed I shopped my stash. At first I went for some mystery black suiting that I had no plans for but when I had the pattern pieces laid out, it dawned on me that it’d be hard to see or photograph fitting issues and the whole point of this make was to get rid of that ‘n’ shaped issue! 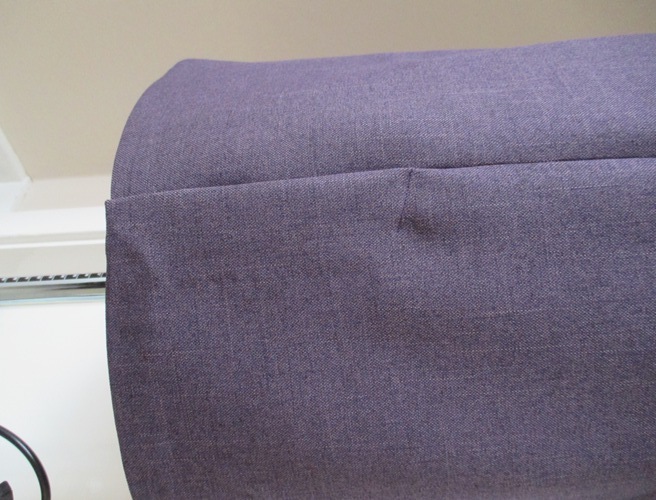 A quick re-think and I sacrificed this purple suiting that was meant to become a pencil skirt. 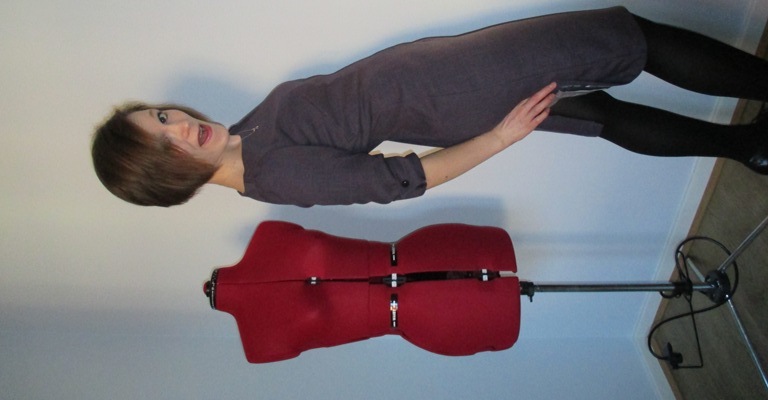 This make made me realise that although we have the same measurement, my bust is different to my dressmakers dummy. The darts look ridiculously close on her. So, has moving the darts solved the mysterious fitting issue on me? Looks okay from this angle… and more ease in the hips helps smooth things out in that region too. Still no bust ripple from this angle either. 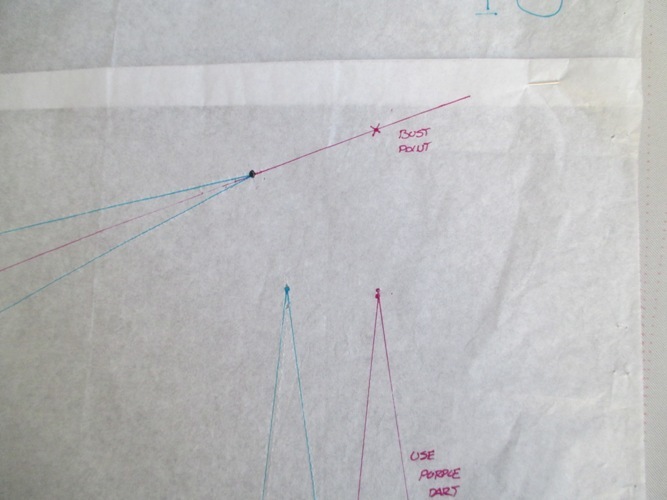 Thank you sewing gods for reminding me of dart positioning. Yeah, I think the ripple has been banished. I’m also happier with a bit more ease round the hips. Over 3 meters of this gorgeous silvery white lining was languishing in my stash. It reminds me of the silvery blue sheen that gin has. I was feeling quite chuffed with my stash shopping and even used the bias binding I’d made from the leftover scraps of my blouse to bind the raw edge before hemming. Bother, that blouse would have gone great with a purple pencil skirt! Nevermind, I’m still on track with my Stash Diet. I’m considering switching the buttons for fabric covered. Undecided yet. Want to see more details? I took loads of photos, I think the number of photos in my posts correlates to how pleased I am with my make! I fully lined the dress including the sleeves. 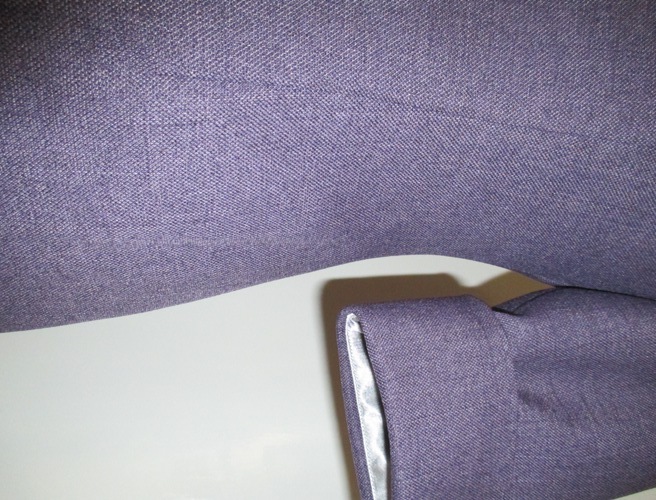 It’s pretty easy due to the sleeve cuffs but does require some extra understitching to stop the lining rolling to the outside. I found myself swapping the different coloured threads on my sewing machine constantly. Perhaps I’ll stick with matching lining to make things easier in future! Another cool lining detail was attaching it by machine to the zip… I thought it’d be difficult but it’s actually pretty easy (following Tasia’s instructions). I shoe horned in my favourite skill – lining a vent. 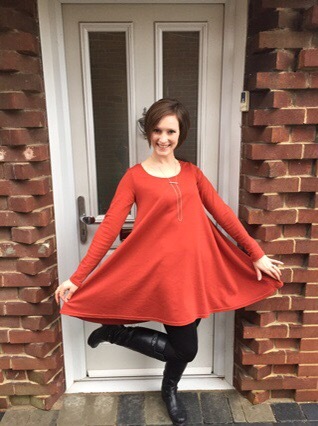 It’s not easy demonstrating a lined vent while wearing the dress! Like this? I’m going to be telling you all about how you can get involved with lined vents tomorrow! Like the whack-a-mole game you just never know when another New Look 6000 will pop up. See? But for my next make of this pattern I’ll add a little more ease around my hips to get rid of it completely. What doesn’t disappear no matter how much smoothing of standing tall I do is the ‘n’ shaped ripple under my bust. What adjustment do I need to do for this fitting issue please? The fit in the back is pretty good though. 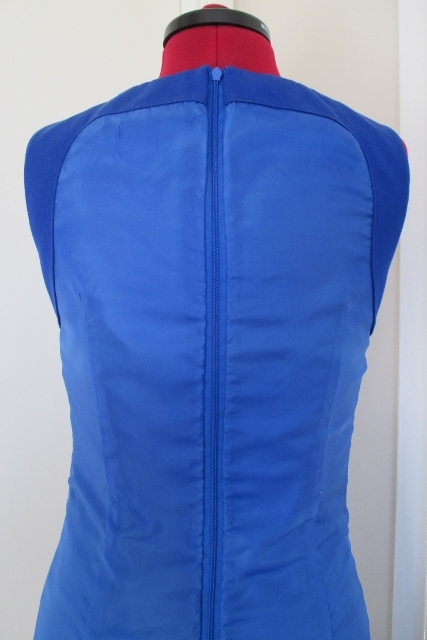 I took out some back neck gape before attaching the zip. Overlocker incident No. 1. 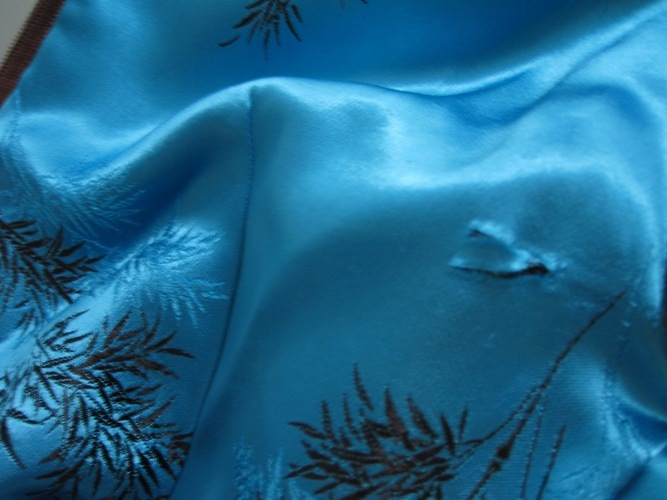 I’m surprised to have owned the machine for 5 months before the first incident occurred and luckily it only caught the lining not the shell fabric. 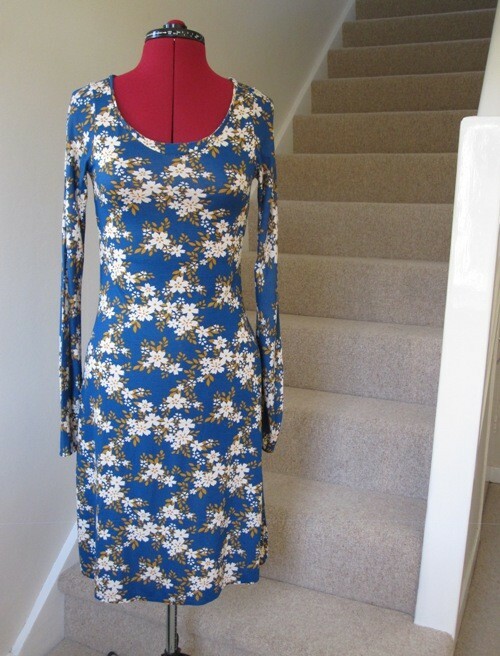 Despite my frivolity for the final photograph, I’m not completely happy with this dress yet… and so not done with the pattern either! A famous quote from Audrey Hepburn and totally appropriate for my first make of the Audrey Dress. Maria Denmark’s B cup or C cup sized pattern. I have a confession. I’m a naughty home sewer. I didn’t add a seam allowance. Oh go on, snitch on me to the head (seam)mistress – I can take detention as a consequence of my actions, or maybe a punishment befitting of my unacceptable behavior.